Africulturban is a cultural association that works for the promotion and development of Hip Hop and urban culture (Dj Rap Graffiti Breakdance Slam etc.) in Senegal and in Africa through frameworks of artistic expression (festival concert exhibition conference workshops projection forum debate training). As part of his return cultural 2011/2012 Africulturban Launches Project Jam Session. Jam Session is a monthly project from October 2011 until June 2012. 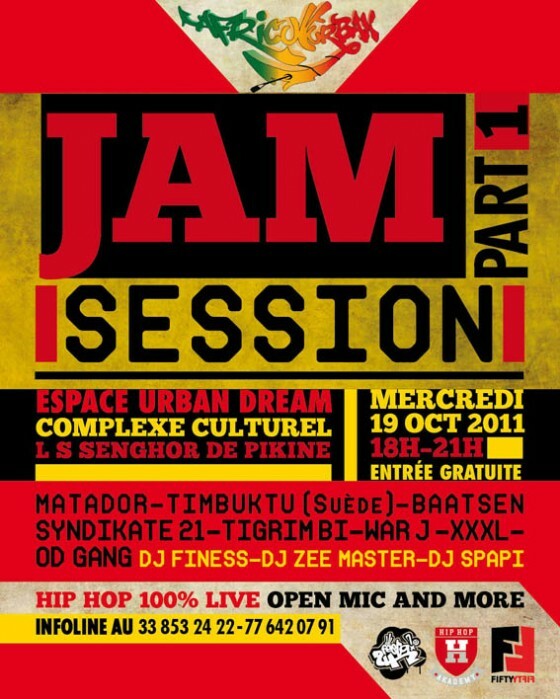 Jam Session is to restore the Hip Hop acclaim by the live and freestyle. So that the public is in a festive atmosphere of peace and friendliness. Admission is free and the first part is done by young bands from the underground scene of Senegal.